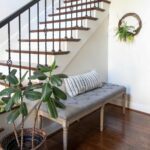 Welcome back to our first update post for the One Room Challenge! I can’t believe it is here already, but I am excited to share more details and the design plan today. 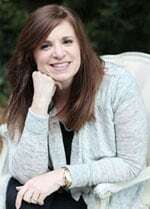 If you are new to this, Linda at Calling it Home organizes this fantastic event twice a year. 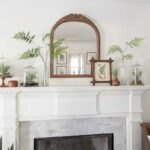 I kind of eluded in last week’s post (You can see all of the before photos, here. 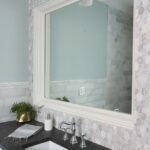 )that this season’s One Room Challenge was somewhat of a do-over, in as much as I am remodeling a master bathroom again, I had taken various inspiration from sites online from both small and large projects so I could see the potential for development. Here’s the link of one sites I had completed some research on, neumannsmith.com/detroit-studio. 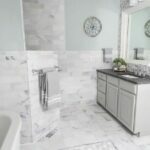 I am again using marble tile for the floor and shower. 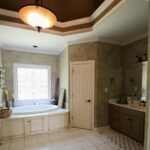 Leaving last years’ master bathroom for the opportunity to buy the Trail House Reno, left me longing for more. But as you can see from the design plan below, the room will be much more opulent, warmer and this time, despite how gorgeous the polished chrome was in the previous space, I’m glamming it up with champagne bronze fixtures. The most influential inspiration for the room is an ornately paneled room. Using substantial interior finishes often reserved for formal spaces like living rooms and dining rooms will bring some cohesiveness. Right now the room has an interesting octagon shaped, vaulted ceiling. As the room evolves, I think you will see the panel trim complement the existing architecture. Hopefully, it will transform this awkwardly shaped room into a cohesive jewel. I am extremely proud and thankful for the partnership with Metrie on this project! 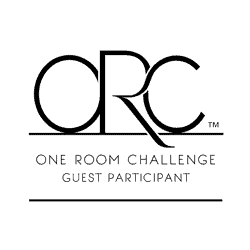 They have been behind this project since the early conceptional phase. So, here’s where we are now. I think it is safe to say I am at least 85% finished setting all of the floor tiles. 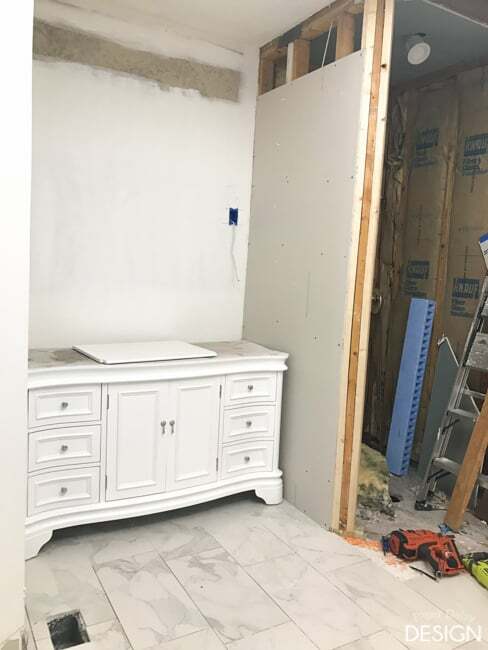 Tile still needs to be laid in the water closet and the two clothes closets and then grouted. I had to give myself a break after a hard weekend of work and an unfortunate car accident. Needless to say, I was quite sore and out of sorts. 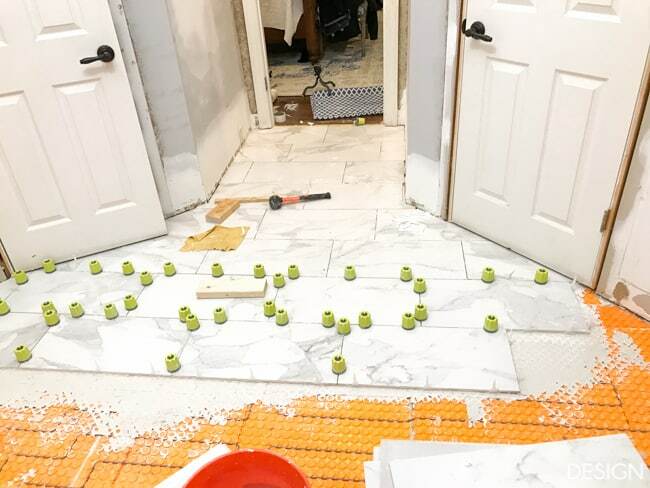 I’m not going to lie, laying large format porcelain tile like these 12 x24 porcelain tiles are quite a chore, especially over the Ditra-Heat floor warming system which requires a specific mortar base. 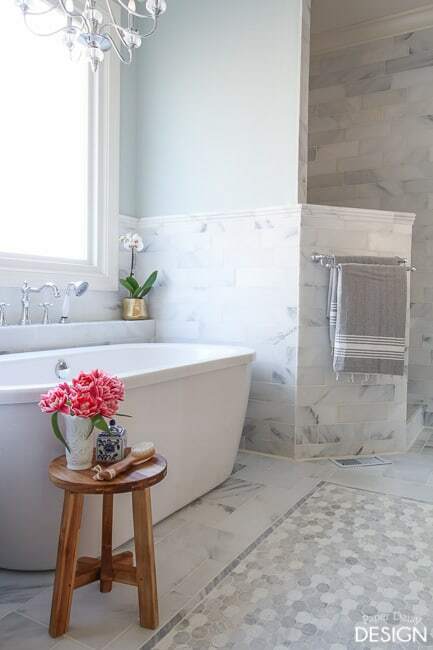 Isn’t this tile the most beautiful reproduction Calcutta marble tiles you’ve ever seen? I am so thankful to have the opportunity to premier this gorgeous new the porcelain from my favorite flooring and tile source, South Cypress. They hope to have it up on their site and available for purchase very soon. The cute little “minions” all over the floor are a unique leveling system also offered by South Cypress. I can’t imagine the endless struggles I’d be going through if it were not for this Leveltec system by Profilitec. 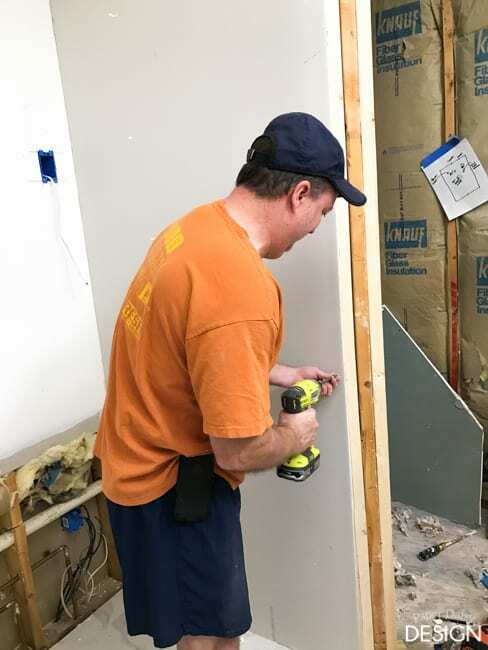 In preparation for the measurement of the marble countertops on Tuesday, Richard finished rebuilding the shower wall over the weekend. 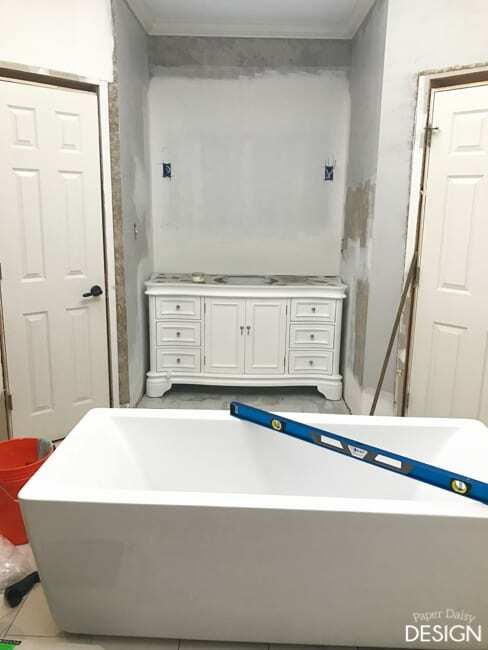 The stud placement was off on the shower wall and our pre-made niche did not fit. 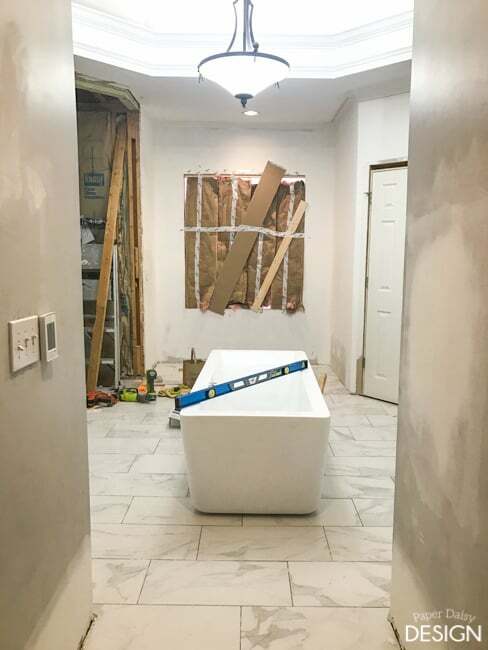 Now we just need the plumber to come back and rough it all in. 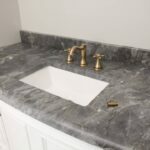 Next week I’ll share a photo of the new marble for the vanities. They sit directly across from each other in the room, each in their own recessed area. In this photo, you can partially see the design dilemma I eluded to with the numerous doors and odd angles. While I am happy we had a good foundation started with the room already demoed and the flooring system in place before Week One, there is still so much to do. Order and install glass shower wall and door. Whew! That’s enough to make me feel a little nervous. I still have a few surprises up my sleeve, so stay tuned! 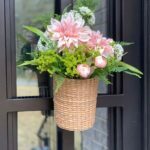 This post contains affiliate links for your convenience and to provide support the blog and renovation at no extra cost to you. Don’t forget to check out the other participants and see their progress on the One Room Challenge here. Thanks, Emily! 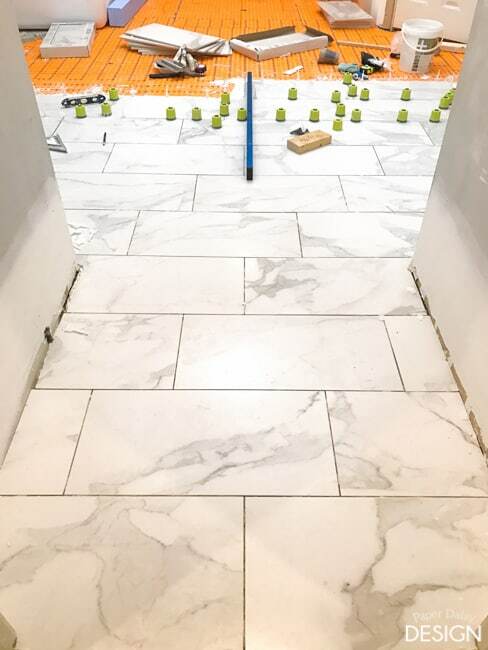 Wait until you see this tile finished! It is so beautiful. 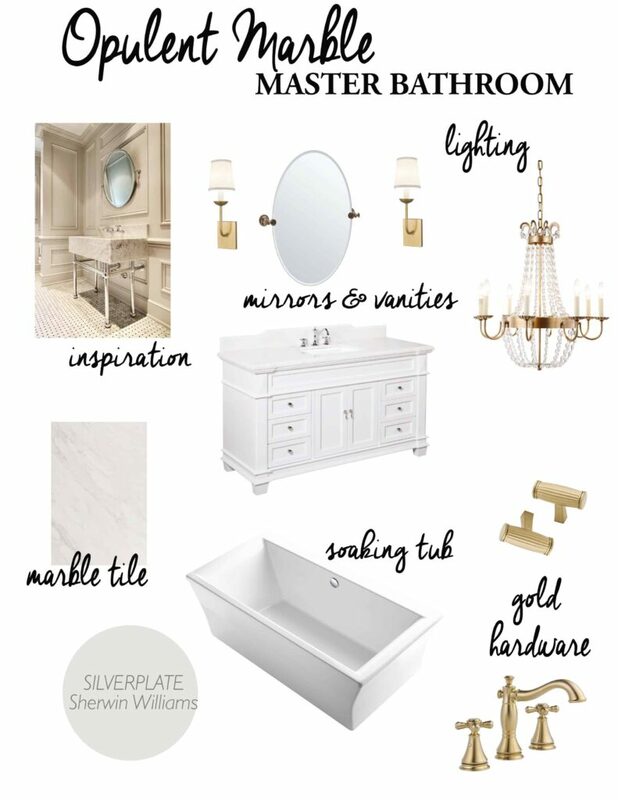 I have never seen porcelain imitate marble as well. The tone and finish are remarkable. I would never get out of that tub. Seriously you’ll be living in that bathroom! : ) haha, just beautiful! I can’t wait! I miss the previous soaker tub we installed at our other house. Thanks! !